​The fungal agent that causes this disease spread from Europe to the United States prior to the 1930s (2). There are two fungi that cause this disease, Ophiostoma ulmi and Ophiostoma novoulmi (2). The fungi spread from infected trees to health trees via a beetle vector or through grafted roots (1,3). The main beetle vectors are the native elm bark beetle and the European elm bark beetle (figure 2) (2). These beetles are attracted to stressed, dying, and dead elm trees to complete the breeding stage (2). Adult beetles burrow into the wood and lay their eggs in galleries, once the eggs hatch the larvae feed on the sapwood and inner bark (figure 3) (2,3). Dutch Elm Disease results in a fungal infection in the vascular systemof the tree, which causes clogging in the vascular system and prevents water from moving to the crown (2). 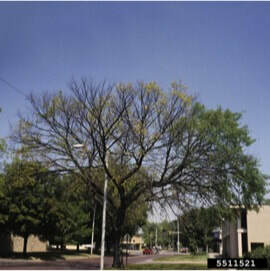 The main visual symptoms are wilting and dieback (2). First, leaves begin to wilt then turn yellow, then brown, and dieback (2). Symptoms usually appear in the late spring and early summer but have been recorded at other times during the growing season (late spring through fall) and in the early spring when infection occurs in the fall (1).